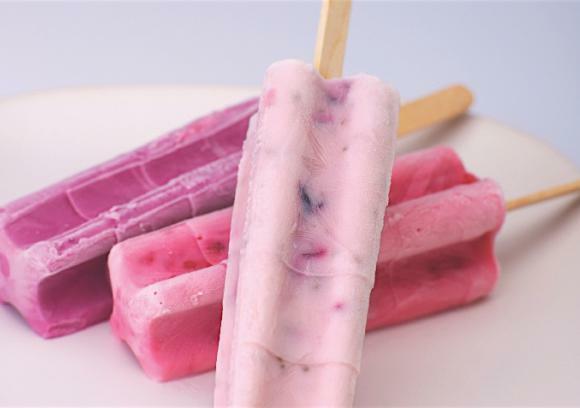 A tasty and healthy way to beat the heat and extend the berry season (if you can stand not eating them right away)! In a saucepan, bring the berries, sugar, honey and water to a boil. Simmer for a few minutes to dissolve the sugar, remove from heat, and pulse in a food processor until just chunky. Place the mixture into a small bowl and cool it in the refrigerator for 15-20 minutes. Whisk or fold the yogurt and lemon juice into the berry mixture until thoroughly combined. Pour the mixture into molds (see Tips & Notes) and freeze for at least 5 hours. Run molds under hot water to release the ice pops. If you can’t find molds, use paper cups and wooden paddles or sticks. Freeze the ice pop mixture in ice cube trays, and serve two or three in a tall glass of ginger ale for a fun summer cooler. For a non-dairy version, substitute soy yogurt or coconut milk yogurt for the Greek yogurt.